Use LED filament bulbs for a traditional look. 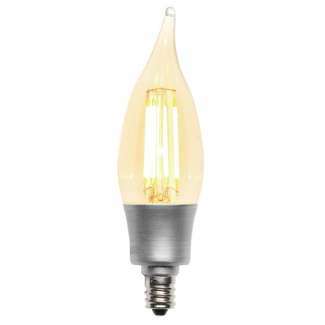 The decorative LED is aesthetically designed to look like a traditional incandescent light bulb, making it ideal for use in open-design fixtures. Producing a warm amber glow with a nostalgic feel, it is perfect for chandeliers and outdoor wall fixtures. This CA10 Filament LED candelabra base light bulb reduces energy and operating costs up to 87 percent, saving $57.75 over the lifetime of the bulb compared to a standard 40-watt incandescent bulb. 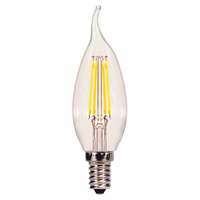 LEDs are free of harmful mercury making them a great choice for your replacement needs.